Bob Carver Corp Crimson 275 stereo tube power amplifier. Congrats... Bob builds some great tube amps. I look forward to a more in-depth review. Forget the review, how about some pics. That is a SPECTACULAR amp. Congrats!!! Curious on the review also. 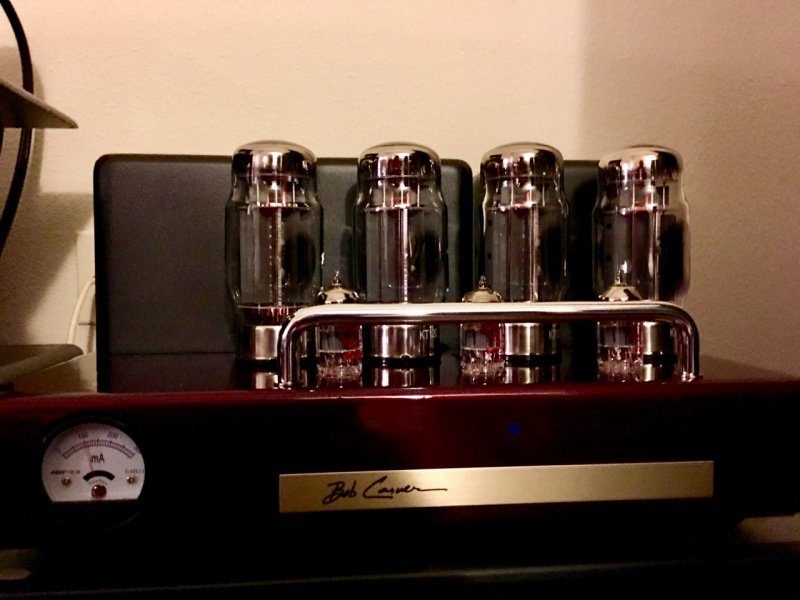 What's most interesting to me is that Bob Carver somehow developed a relatively high output tube power amp that doesn't burn its power tubes up. That's wizardry! Always a pleasure to interact with you Dennis. Bob did some calculations and he figures that the KT120s operating in the Crimson 275 using his DC restorer circuit should last in excess of 40 years. Looking forward to hearing more about this amp. I did just see this Someplace Else. This guy seems to like his. Also, I am curious as to whether anyone else here ended up buying one of these amps when they were on sale late last year. If so, what are folks thinking of it/them? These are fantastic Amplifiers. I've heard it several different times with various preamps and speakers and have always found them to sound really nice. I will have one myself within the next month. If anybody is interested in one, I know that the introductory deal is over, but Jim Clark stereo in Rockford Illinois does offer trade-in allowances! cool, keep us posted on your experience with one in house. I am still kind of intrigued by these -- although not intrigued enough to invest in one*. * mostly because, if I did, the first thing I'd do is open it up and (try to) trace out the circuitry -- so I wouldn't be able to return it as "new" if I didn't like it!